SIMILAR HARDNESS IN PROPERTY AS CAST IRON, BUT MAJOR ADVANTAGES ON STRETCH RECOVERY AND BEND RESISTANCE. LESS NOISE AND LOWER VIBRATION TRANSMISSIONS. DESIGNED TO MEET AND EXCEED A 15/ B125/ C250/ D400/ E600/ F900 LOADING RATING, ACCORDING TO EN 124: 1994. 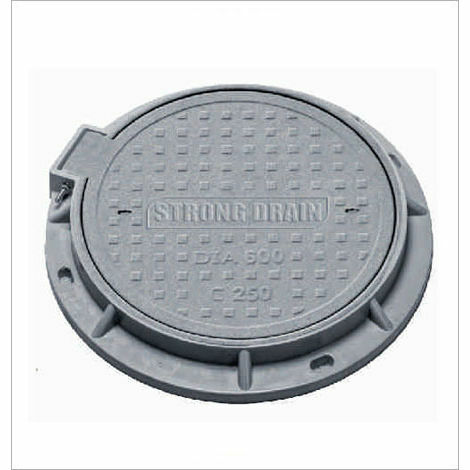 COMPARING WITH CAST IRON MANHOLE COVER, COMPOSITE COVER HAS ZERO THEFT VALUE AND NOT ATTRACTIVE TO THIEVES, WHICH REDUCE THE POTENTIAL ACCIDENT AND FURTHER MAINTENANCE COST CAUSED BY THEFT. SURFACE ANTI-SLIP THREAD GUARANTEES SAFE ROAD CONDITION EVEN IN EXTREME WEATHER. LOCKS ARE AVAILABLE AS AN OPTION MOLDED INTO THE COVER TO IMPROVE SECURITY RATE. NON-ELECTRICITY CONDITION AND NON-HEAT CONDUCTION, UV RESISTANCE. COMPARED WITH CAST IRON MANHOLE COVERS, COMPOSITED COVERS ARE 30% LIGHTER, LIGHTER WEIGHT ALLOWS EASE OF HANDLING, MORE LOADING PER VEHICLE AND MORE CONVENIENT TRANSPORTATION. THIS ALLOWS FOR SAFE WORKING CONDITIONS, WHERE A SINGLE WORKER IS ENOUGH FOR A COMPLETE INSTALLATION WITHOUT RISK OF INJURY. EASY HANDLING AND MOVEMENT REDUCE MAINTENANCE COST. MORE THAN 30 YEARS THEORETICAL SERVICE LIFE AT USUAL ROAD CONDITION. ANTI CORROSION, DUST AND WATERPROOF, WELL SEALED PREVENT POISONOUS GASES FROM LEAKING OUT. HIGHER AND LOWER TEMPERATURE TOLERANCE. COMPOSITE MATERIAL ITSELF ALLOWS FOR INNOVATIVE DESIGN FEATURES, CLIENT LOGO AND THEIR OWN DESIGN IS AVAILABLE AS AN OPTION. MUCH MORE CLEAR RESOLUTION RATIO DESIGN THAN CAST IRON OR OF OTHER MATERIAL. LOWER EMBEDDED ENERGY CARBON EMISSION DURING MANUFACTURING PROCESS THAN CAST IRON COVERS. NEW MATERIAL, MANUFACTURING TECHNOLOGY AND LEAN PRODUCTION HELP REDUCE CARBON FOOTPRINT. BENEFITS COMPARED TO METAL COVERS:- SIGNIFICANT REDUCTION IN HEAT TRANSFER LIGHTWEIGHT WITHOUT COMPROMISING STRENGTH ERGONOMIC REMOVAL AND REPLACEMENT WITH SPECIALLY DESIGNED HANDLE WATERLIGHT WITH PROVEN PERFORMANCE UNDER LOAD PRODUCES SIGNIFICANTLY LESS CONDENSATION ON UNDERSIDE OF COVER ANTI-STATIC AND DOES NOT CONDUCT ELECTRICITY IMPROVED ANTI-SKID AND ANTI-WEAR PROPERTIES NON-CORROSIVE AND RESISTANT TO SODIUM CHLORIDE ELIMINATES RISK OF THEFT DUE TO NO SCRAP/RESALE VALUE OTHER BENEFITS: MONOLITHIC STRUCTURE WILL NOT CRACK OR DELAMINATE MAINTENANCE FREE MULTIFACETED DESIGN THAT WONT SPIN OUT ADVANTAGES AND FEATURES:- HIGH LOAD RATING AND STRENGTH SIMILAR HARDNESS IN PROPERTY AS CAST IRON, BUT MAJOR ADVANTAGES ON STRETCH RECOVERY AND BEND RESISTANCE. LESS NOISE AND LOWER VIBRATION TRANSMISSIONS. DESIGNED TO MEET AND EXCEED A 15/ B125/ C250/ D400/ E600/ F900 LOADING RATING, ACCORDING TO EN 124: 1994. 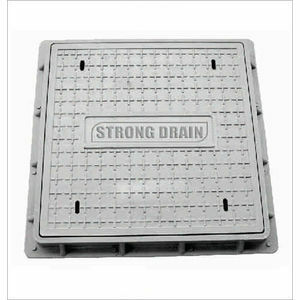 AGAINST THEFT AND SAFETY OPTIONS COMPARING WITH CAST IRON MANHOLE COVER, COMPOSITE COVER HAS ZERO THEFT VALUE AND NOT ATTRACTIVE TO THIEVES, WHICH REDUCE THE POTENTIAL ACCIDENT AND FURTHER MAINTENANCE COST CAUSED BY THEFT. SURFACE ANTI-SLIP THREAD GUARANTEES SAFE ROAD CONDITION EVEN IN EXTREME WEATHER. LOCKS ARE AVAILABLE AS AN OPTION MOLDED INTO THE COVER TO IMPROVE SECURITY RATE. NON-ELECTRICITY CONDITION AND NON-HEAT CONDUCTION, UV RESISTANCE. 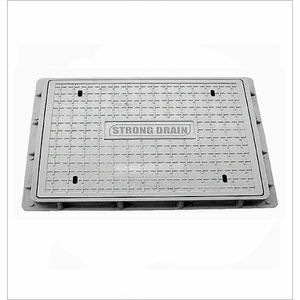 EASE IN INSTALLATION COMPARED WITH CAST IRON MANHOLE COVERS, COMPOSITED COVERS ARE 30% LIGHTER, LIGHTER WEIGHT ALLOWS EASE OF HANDLING, MORE LOADING PER VEHICLE AND MORE CONVENIENT TRANSPORTATION. THIS ALLOWS FOR SAFE WORKING CONDITIONS, WHERE A SINGLE WORKER IS ENOUGH FOR A COMPLETE INSTALLATION WITHOUT RISK OF INJURY. EASY HANDLING AND MOVEMENT REDUCE MAINTENANCE COST. DURABLE SERVICE LIFE MORE THAN 30 YEARS THEORETICAL SERVICE LIFE AT USUAL ROAD CONDITION. ANTI CORROSION, DUST AND WATERPROOF, WELL SEALED PREVENT POISONOUS GASES FROM LEAKING OUT. HIGHER AND LOWER TEMPERATURE TOLERANCE. FREE DESIGN COMPOSITE MATERIAL ITSELF ALLOWS FOR INNOVATIVE DESIGN FEATURES, CLIENT LOGO AND THEIR OWN DESIGN IS AVAILABLE AS AN OPTION. MUCH MORE CLEAR RESOLUTION RATIO DESIGN THAN CAST IRON OR OF OTHER MATERIAL. CARBON FOOTPRINT SAVING AND ENVIRONMENTAL CARE LOWER EMBEDDED ENERGY CARBON EMISSION DURING MANUFACTURING PROCESS THAN CAST IRON COVERS. NEW MATERIAL, MANUFACTURING TECHNOLOGY AND LEAN PRODUCTION HELP REDUCE CARBON FOOTPRINT.